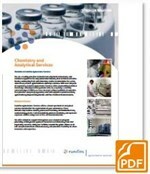 Eurofins Agroscience Services offers a complete range of product chemistry testing including basic physico-chemical properties, studies relevant for environmental exposure and hazard / risk assessment, transport, user risk studies and shelf life of formulated products (OECD, EC directives, CIPAC methods). We also provide analytical services for impurity profiling and 5-batch analysis (material accountability / change control / anti-counterfeighting) in close cooperation with our sponsors. We have a wide spread experience with most types of formulations and actives and can offer these both as GLP as well as non-GLP. Climatic test chambers are available for studies at defined temperature and storage stabilities / shelf life studies, including large cooling chambers. For further details on the Product Chemistry Services portfolio, please email Rebecca Driesener or download our Chemistry services PDF as a general introduction.